Rep. Brandon McGee, D-Hartford speaks with Capitol reporters. Other members of the Black and Puerto Rican Caucus include, left to right, Rep. Juan Candelaria, D-New Haven; Rep. Christopher Rosario, D-Bridgeport; and Rep. Robert Gibson, D-Windsor. 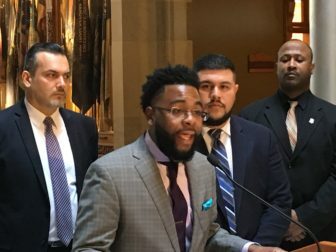 Pay equity, a “liveable” wage and protecting women’s health care topped a list of priorities unveiled Monday by the General Assembly’s Black and Puerto Rican Caucus. And while the agenda does not propose specific tax hikes, the 24-member caucus does back several revenue-raisers to fund critical services, according to its chairman, Rep. Christopher Rosario, D-Bridgeport. “Supporting our middle-class families and creating opportunities for everyone is something we fully support as a group,” he said. A state panel recently proposed boosting Connecticut’s minimum wage to $15 per hour, while the House and Senate Democratic caucuses and Gov. Dannel P. Malloy have called for the legislature to reduce the gender pay-equity gap this year. Securing support for displaced families from Puerto Rico and providing disaster assistance to citizens who have relocated to Connecticut. Addressing mistreatment of inmates and providing quality healthcare, including treatment for opioid addiction, in all Connecticut prisons. Facilitating recruitment and retention of minority teachers. And continuing to promote workforce development. Several of these priorities, particularly those involving healthcare, would require millions of dollars in funding. Caucus members noted, for example, that the new state budget adopted last October tightened eligibility requirements for subsidized health care through the Husky program for poor adults, removing about 9,500 people from the rolls. Reversing this cut would cost about $11.3 million per year. Rosario said even though revenue proposals aren’t on the agenda, most caucus members consistently support raising income tax rates on the wealthy. Other revenue-raising options include taxing sports betting and recreational marijuana sales. “Those are options that can definitely be looked at,” he said.